To read the artist’s statement that accompanies each quilt, please scroll down. If the artist’s name is highlighted, that is a link to their website or blog. 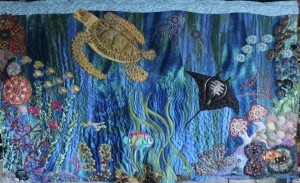 Our most sincere thanks to Rodney Bowles for the photography of the quilts. Every day this young girl makes the perilous trek from her village to the river to collect the water her family desperately needs for drinking and cooking. One fateful day, her routine turned dangerous. Two strangers raped her. She still had to continue on to the river that day, and every day since. That was seven months ago. Not only is this girl’s life impacted by the daily task of collecting water, but that responsibility is now amplified by her pregnancy. In her case, water is literally a new life. This quilt features hand and machine appliqué, machine piecing and quilting as well as silk, satin, cotton, organza, tulle, velvet, and linens. It’s embellished with beads, rope trim, and an African cowrie shell. 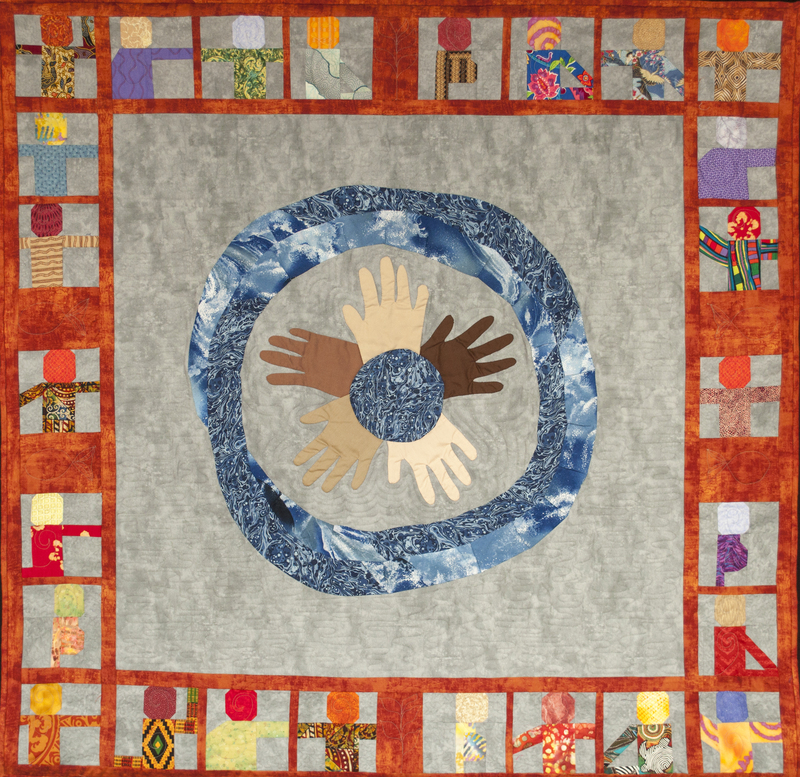 Inspired by visions, experiences, books, news reports, and debates on TV and concerned with contemporary problems regarding human conditions, this quilt interprets personal concerns, pain and fears. The title half-opens the door to a story easily read by the viewer. “In Africa and Asia, women and children walk an average of 3.7 miles a day just to collect water”. It’s heartbreaking for the mothers and fathers alike to let their children go and search for water to drink or cook safely; for washing or having a wash and for cultivating plants. This lack of water is due to any or all country aspects: climate, political, economic and or social conditions. 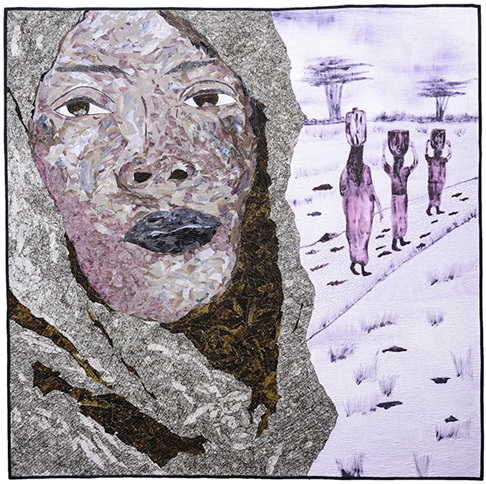 The aim of this quilt is to create awareness through the silent dialogue proposed by the woman depicted and the viewer. 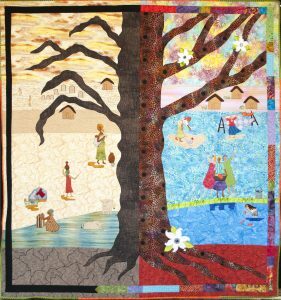 The mother in the quilt shows the children going for this quest; she worries for the present: her boy is alone, which may be dangerous; she worries for the future too: no time for education. Creating the story for which threads and fabrics can be the vocabulary, “mots-matière”. Water is the crucial and essential ingredient necessary for life on planet Earth. Without water, there would have been no evolution, no movement forward. The planet’s waters are the cradle of mankind, having given rise to all sorts of life forms and, eventually, mankind. 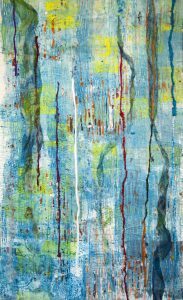 Now, water permeates mother Earth and acts as the elixir of life, bringing life-giving moisture and nutrients up from the depths. Without water, we would perish. Water gave birth to and continues to sustain all life. The human female depends on the goodness and cleanliness of water to nurture herself and her loved ones. Women are also essential to life – we bring forth generations of people and pass down the message of good stewardship of the land, to those who follow. 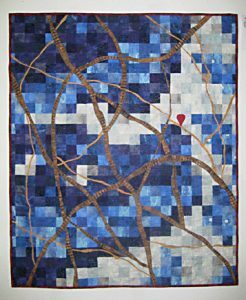 The blue in the quilt, like water, represents the idea that women need to be free of the compromising factors that might weaken their ability to create progress and goodness in the world. If we are to continue to flourish as a species, we must protect the delicate rights of both our human mothers and mother Earth and her precious gift of water – our destinies are interwoven for all eternity. In today’s society, triviality of every day life often obscures what is of greater importance. It is so hard to believe that something can be taken for granted, wasted by so many and yet be such an invaluable lifesaving resource, far out of reach to others. The vast number of women and children affected by an inadequate supply or lack of proper access to a clean source of water is astounding. The countless hours spent collecting water, the distance travelled and the perilous conditions these women have to endure in order to find water on a daily basis is staggering. 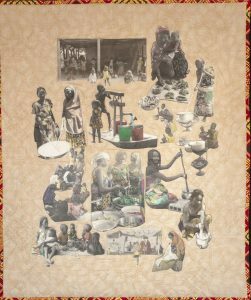 “Our Journey,” is a thought-provoking piece drawing attention to this plight and adding a voice representing those women who cannot speak, so that all of us can hear their desperate, silent cries for help. Every morning after a comfortable night’s sleep, I take a shower, brush my teeth and have a cup of coffee – all of which require clean water. Only now, I realize many people like me take all of this for granted. Clean water is just always there. 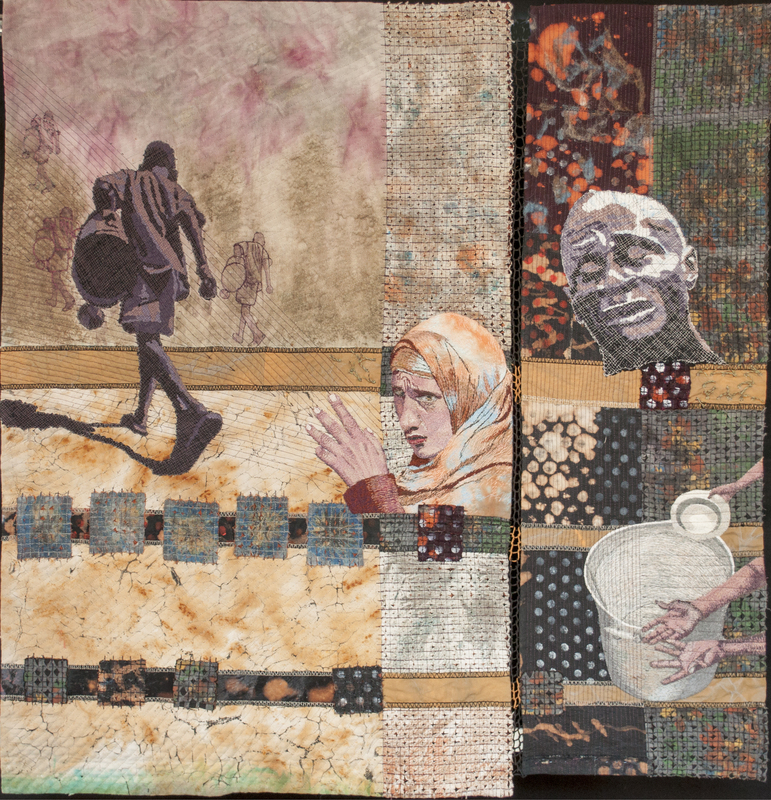 When I started this quilt, I became more aware about the hardships many women endure every day. I learned that there are droughts all over the world and in every country. In some countries women spend hours every day bringing water into their homes and for others water may be close by yet under severe rationing. Some places have water but it’s contaminated and if used even to water fields it would cause illness and spoil the food supply. This project has made me very grateful for having clean water and mindful not to waste this precious comity. 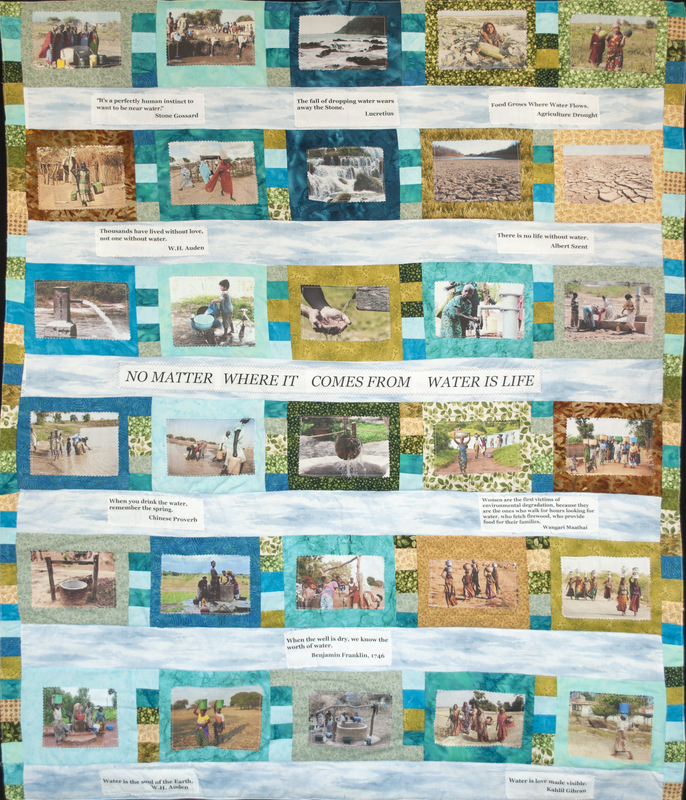 This quilt embodies the world’s hardships of not having clean water and inspires the need for programs to improve current conditions. 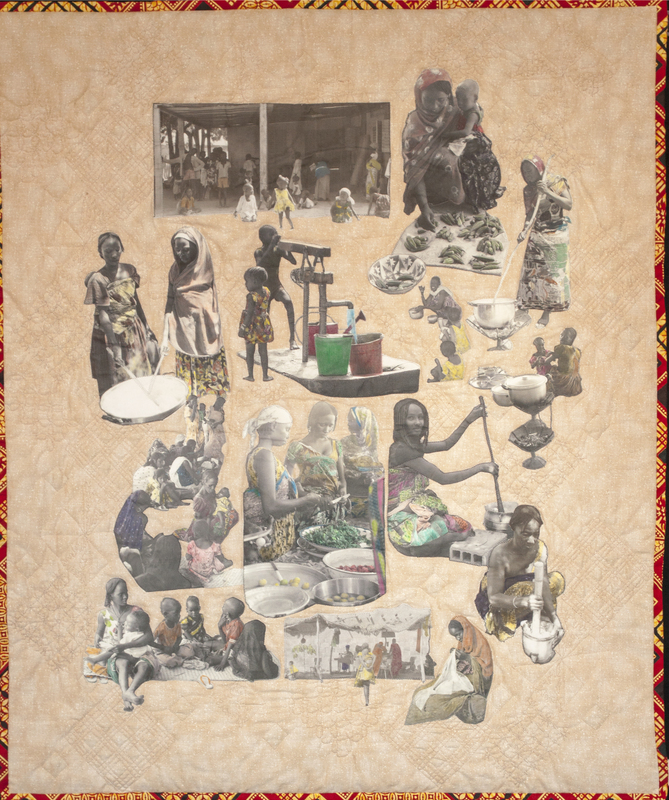 For this quilt, I was inspired by my experience at the Women’s Social Center where almost every day, women and children, who had fled the fighting in Northern Chad, would come to the social center to learn the basics of keeping children, and themselves, healthy. At the same time that some of the women were learning to prepare nutritious meals with the foods available in the area, the center was showing them visuals on how to build latrines away from the home, not dilute baby formula, and boil water. Some of the women had the opportunity to learn how to sew on treadle sewing machines. It was hoped that the women would learn how to create small items that they could then sell. The photos, taken over the course of a year, reflect what can be accomplished when governments and NGO’s work together to help improve the lives of those faced with the hardships of war and the importance of clean water to their lives. Water is The Source of Life. We sing and dance to it, pray for it, and dream and write about it. Water quenches our thirst, grows our food, washes us, and gives us means of play and relaxation. As our world becomes more crowded and our resources diminish, our water will become more cherished, causing us to rethink our lifestyle. Africa is a patchwork – of cultures, of languages, of ecosystems – and bringing clean water to this continent will be a challenge. But the consequences of success will be powerful, especially in terms of changing the lives of women and girls for the better. By some accounts, less than six per cent of Africa’s farmland is irrigated, and most food crops are grown on small family farms. Africa’s population is predicted to rise dramatically in the next fifty years, and the continent already suffers from hunger and malnutrition. Crop scientists are working furiously to produce new strains of corn, wheat, and rice that are drought resistant. In order to increase yields of these important crops, small-scale, efficient irrigation for family farms will make a big difference; some estimates predict a yield increase of twenty to thirty per cent. In addition, women and children often walk several miles each day to collect water and in doing so spend up to six hours a day in this task. Clean water sources near communities will free up more time for girls to go to school and become literate, and help alleviate food insecurity for families who rely on their vegetable gardens and small farms for their primary nutrition. For women farmers, the ability to grow enough food not only to feed their family, but also to sell the surplus and create income, is a huge step in lifting themselves out of poverty and hunger. 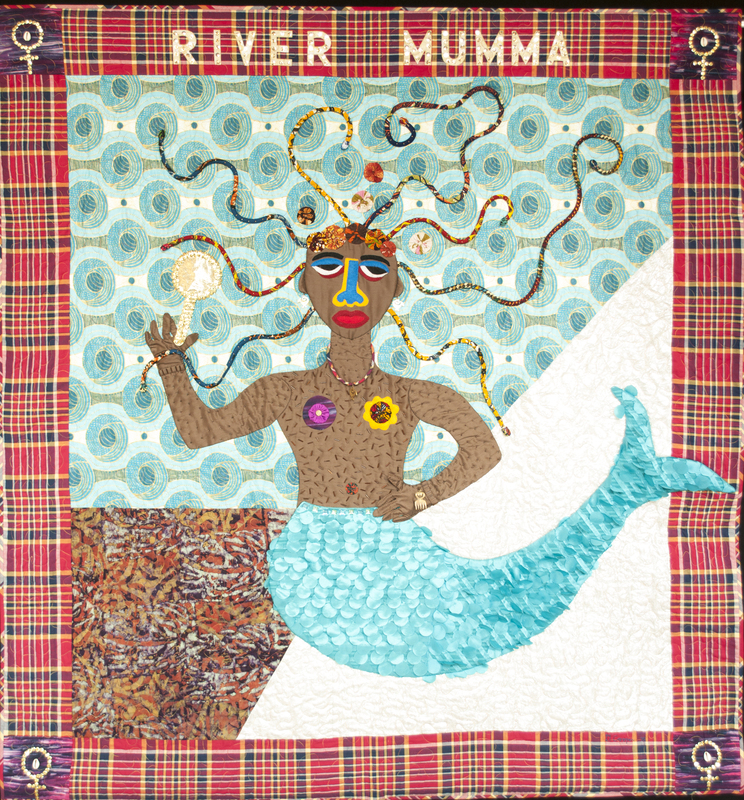 River Mumma (River Mother) embodies the universal truth that water is life. In Jamaican folklore, she is the guardian of the river, conserving it for sustainable development. A complex figure, contradictorily benevolent and malevolent, she both protects and destroys. Exemplifying the paradoxical qualities of water: an essential life force and a torrential threat. River Mumma is the Jamaican manifestation of an alluring water spirit that originates on the continent of Africa, known there as Mami Wata (Mammy Water). 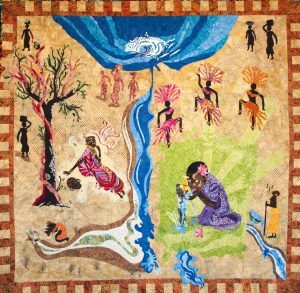 Transported across the terrifying body of water that was the Middle Passage, Mami Wata assumes many names in the African Diaspora. In Haitian Vodou, she is La Sirene. In Cuban Santería and Brazilian Candomblé, she is Yemayá and Yemanjá respectively, reincarnations of the Yoruba river deity Yemoja. In my representation of the River Mumma archetype, I deploy elements of her character that recur in many versions of her mythic story. A seductively beautiful creature with long flowing hair constantly combed, River Mumma carries a mirror to admiringly gaze at her reflection. 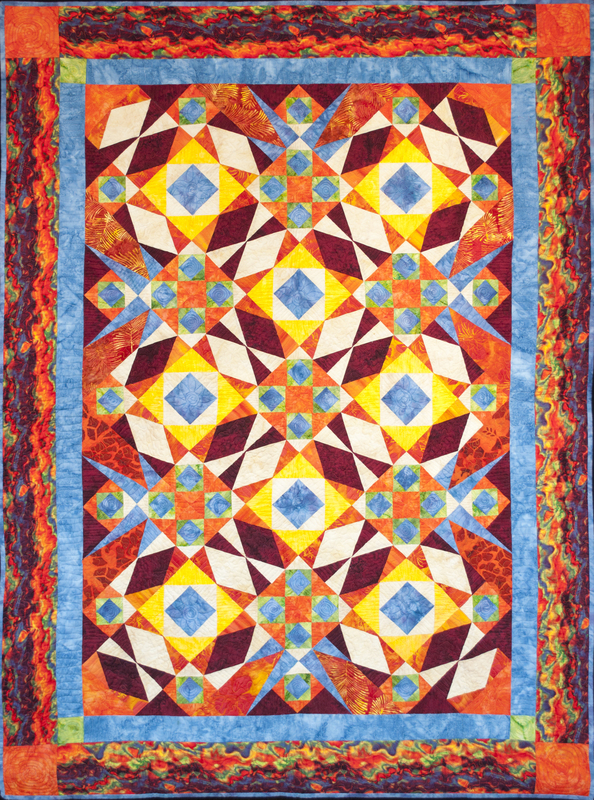 These aesthetic elements are incorporated in the design of the quilt. 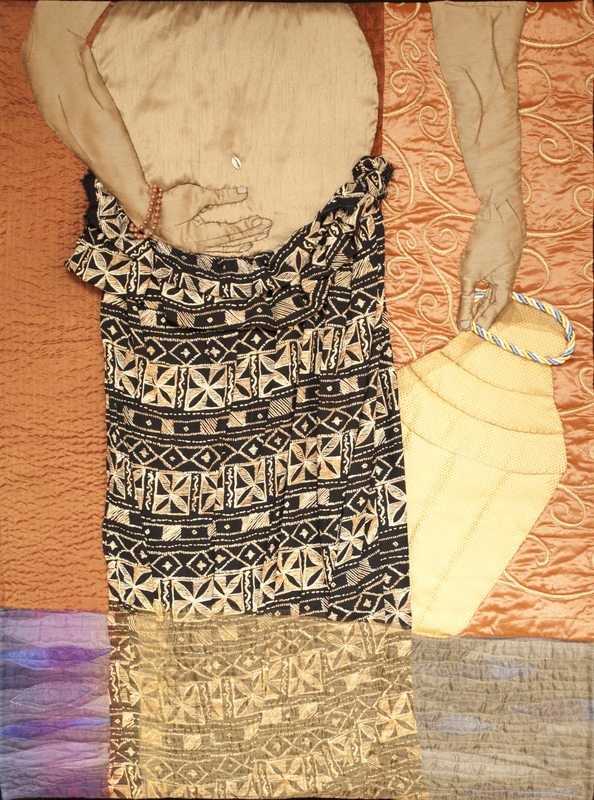 While often imagined as half woman and half fish inhabiting both land and water, I located her at the intersection of earth, sky and water, mixing shades of brown, blue and silver to evoke these elements. In essence, River Mumma emblematizes transcendent African/Diasporic cultures. The Water Lady lives in Northern New Mexico, USA. She stops daily at the St. Bonaventure Indian Mission and fills a bright yellow 3,500-gallon tanker truck with water. Darlene Arviso, age 50, has a long braid of black hair streaked with grey, and she speaks softly, in short sentences, her eyes fixed on the road as she drives. “You can’t drink that water,” she says, “It’s only for animals.” Her long journey begins by carrying the water through the parched countryside between mesas and through arroyos on rough dirt roads. 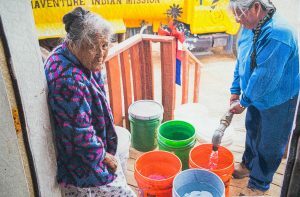 Her mission is to deliver water to 250 families living in the Four Corners region of New Mexico, but most days, she reaches only 10 to 12 of them – meaning that the 400 gallons of water she is able to deliver to each household must last a month. Her families live on roughly seven gallons per day, while the average American consumes 80 to 100. Uranium mining in the region has poisoned wells with radioactive waste leaving residents without clean water. Nearly 40 percent of the estimated 173,000 Navajos living on the reservation lack access to running water. The water Darlene delivers to is kept in buckets and is reused until there is more. Darlene, the Water Lady, continues her daily trips to see her families and deliver water, “liquid gold,” to all. 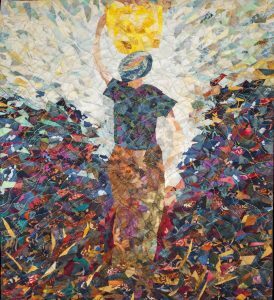 Many of my works are produced from found discarded fabric The idea of recycling and reusing material, giving it a new life is something I enjoy very much. I enjoy the whole process of hunting for the material with the pursuit of an idea of free expression of painting and sewing. 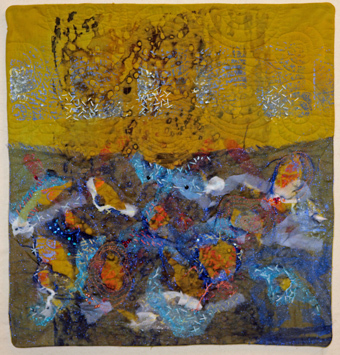 The mechanical act of sewing serves as a form of meditation and review of the work from inside in contrast to the spontaneous free expression in painting. I see a similarity between the flow of water and the process of creation, with ideas drifting towards me as on a river. The use of recycled material can be an allegory for conservation of water, especially in the Middle East where I was born. Israel today is a world leader in high tech water recycling and conservation resulting in an abundant supply of water in this arid part of the world. Providing and safeguarding clean water is a responsibility this woman is urgently connected to. Through clean water she clearly sees a bright future. For women around the world access to clean water is a catalyst to access benefits including health, hygiene, food security, economic success and empowerment. I was inspired to create this piece by the strength and motivation of young women like my daughter (pictured here) who are engaged and optimistic about changing things for the better. Materials used include: cotton, paint, melted carrier bags, recycled hazmat suiting and bread tags. When a woman fishes, she catches more than fish – she has specific goals; while men fish for economic means. Each tagged fish carries a golden thread of anticipation to meet her current needs and that of her family. Her hopes and dreams are cast each time her net is tossed. With clean water, healthy fish can multiply and she can feed her family healthy meals. Clean water produces additional healthy fish – so potentially, her needs and dreams can be realized. 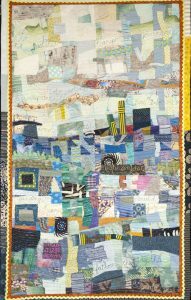 My art quilt’s background is a traditional “Lone Star” design with a yellow center to symbolize the sun, reflecting on diamond shaped water, all contained within a border of 24 foundation-pieced waves. 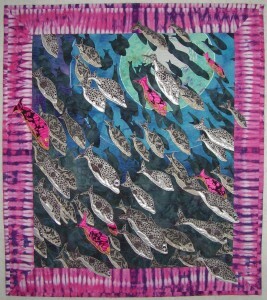 The numerous fish is my original design, placed among a sea of “prairie point” waves. The golden threads and rope symbolize the precious nature of a woman’s catch. 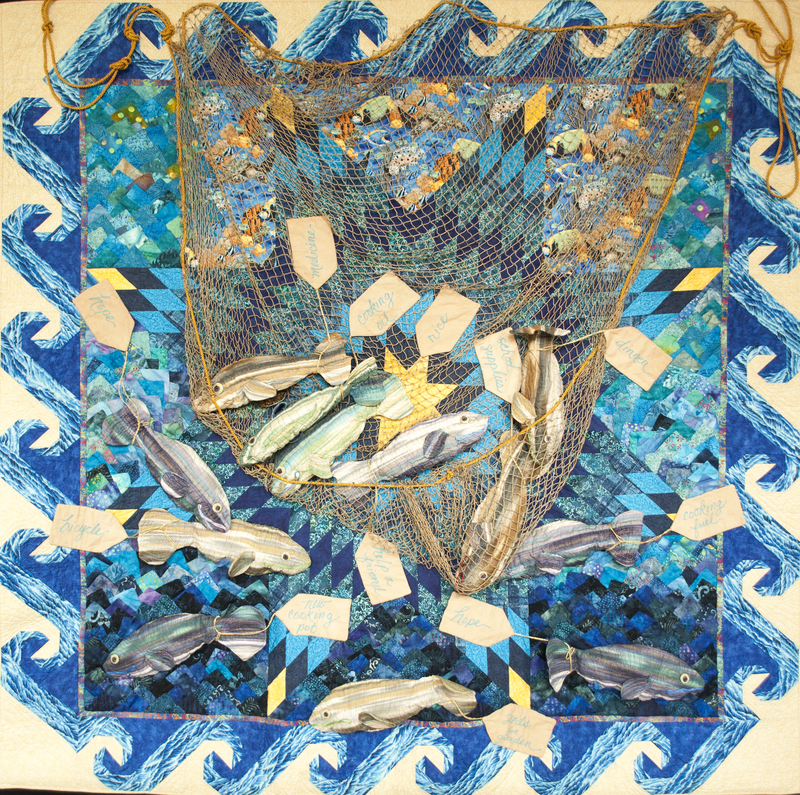 The tag each fish carries represents a fisherwoman’s needs and aspirations. The net is recycled fishnet from Mexico. Such is life for those who live in poverty with unclean water. With an abundance of clean water “Lilly Grace” will have a better chance to grow and prosper into a healthy woman, and can give back to her community and to the world! She is favored with the singing of a grateful woman to her right. Behind her are three joyful dancing women excited for the clean water. In the upper right hand corner are two traveling women coming to the river to gather clean water. Heartbroken “Thirsty Woman” is realizing that with her last drop of clean water she may die and wither away without it. The tree beside her is a representation of living, dying and disease. In the distance, three red silhouettes walking away remind us that unclean water will continually strike with disease or death. The little girl down by the dirty water river is crying, knowing the hardships of unclean water. In the upper left hand corner the black silhouette walking away has no choice but to carry for miles the unclean water back home even while knowing how unhealthy, unclean the water is. A pleading story in the hopes to inspire a giving soul with the heartfelt desire to aspire beyond dreams and do what is necessary to provide clean water for those who are in need! To INSPIRE!…The DESIRE!… To ASPIRE! Looking into the eyes of these beautiful little girls one sees clearly the precious lives of those that are saved by clean water. It was the faces of these children that compelled me to carry their story. Waterborne diseases claim 3.4 million lives worldwide each year and a child dies every 20 seconds from one of these sicknesses. The lives of women and children are drastically affected by the hours spent acquiring and carrying contaminated water necessary for their very existence. This cycle is repeated constantly, daily robbing children of their childhood and women of a productive life. These children have been spared a life of illness and early death because others realized their need and cared enough to develop fresh water sources. Water4, Inc., a local non-profit in Oklahoma, serves as a solution for our world water crisis by passing on the techniques used for drilling wells to local individuals, training and encouraging them to start their own well drilling businesses serving surrounding communities. This opportunity offers dignity and meaning to people who often lack ways to provide for their families as well as to help their neighbors. When clean water becomes a reality, lives are transformed. Now hours previously spent collecting water can be spent by children having the time to go to school. The cycle of water related labor can be broken and women have time to pursue education, jobs, homes, and families. Water gives renewed life. I chose to do an image of pure, clean, sparkling water because the Slovakian proverb, “Pure water is the world’s first and foremost medicine,” which continuously inspires me to think about how universal access to pure water would be an antidote to many of the world’s “ills”. 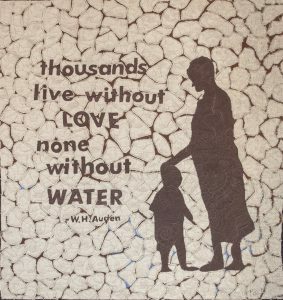 The proverb itself echoes the theme challenge “Water is Life” as one of our most basic requirements. In a perfect world everyone would have equal access to pure, clean water. Imagine the impact this access would have on almost every aspect of the lives of women and girls all over the world! As the primary parties responsible for water collection, women and girls would be able to spend far less of their days collecting water and have increased time for education and socioeconomic opportunities. Access to pure water would significantly decrease the incidence of water-related diseases and allow for better health, sanitation, and school attendance. 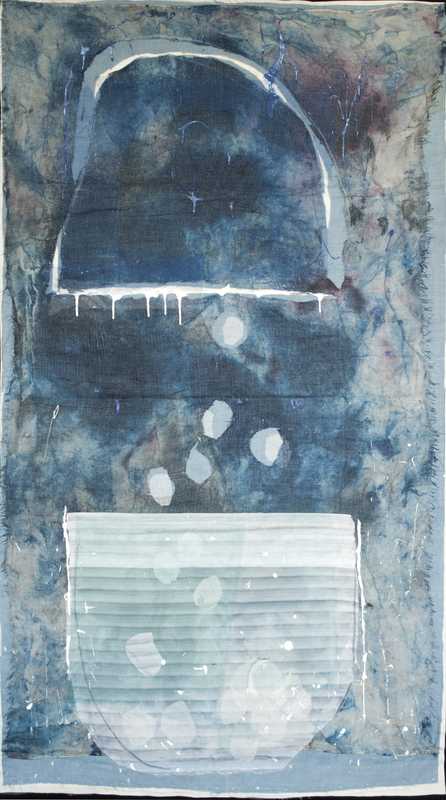 The fiber art piece “Pure Water” is made with satin fabric and sparkly organza that was pole wrapped using a shibori technique and painted with pure blues to represent pure clean water. 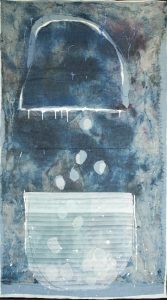 Pieces of the painted organza were “fussy cut” and used as raw edge appliqué overlays to provide a light-reflecting element. 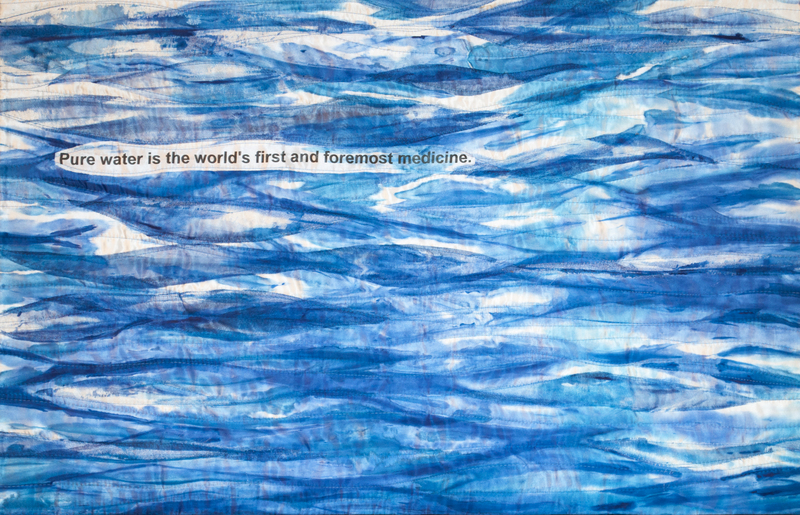 The proverb “Pure water is the world’s first and foremost medicine” was printed on satin and was also applied to the piece using a raw edge technique. I hope to visually communicate the necessity of clean, fresh water for growing rice, a staple in the diet of many people around the world. It provides food security for millions and is its farming reduces rural poverty through self-sufficiency. Water scarcity and competing uses of water is threatening this important food. Rice is planted and grows in approximately five inches (127mm) of water. The water is drained off the rice field for harvest. At harvest, the rice grain is separated from the plant, cleaned of its hull, and dried; it is then ready for consumption. My inspiration for “Ancestral Rice Growing” is my Pacific Islander heritage. I know that my foremothers before me were involved in the rice farming work, and how essential this crop is. 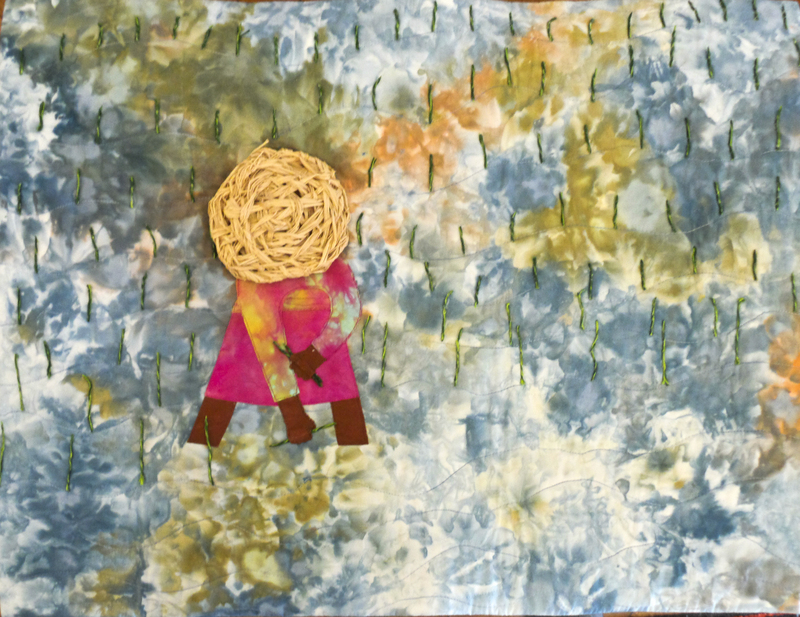 I started “Ancestral Rice Growing” with white fabrics, and then hand dyed those using ice and dye powders, thickened dyes, and other methods to transform them into the piece before you. I also wove the woman’s hat using traditional methods. 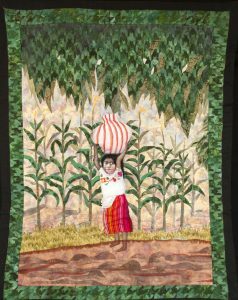 The piece includes raw edge appliqué, and several colors of embroidery floss for the rice plants that were stiffened, then hand stitched onto the fabric. Machine quilting completes the piece, as does the “ghost quilting” to give the feeling that the rice has been grown in the fields for thousands of years. I feel that a piece is not complete until it conveys my essence. “Water is a precious commodity.” That is what my mother always used to say to us when we were kids in the 70’s and 80’s. This statement is true now more than ever. Having never hauled water daily to survive and often thinking of those who do, really made me think about how much we need water and how difficult it is for those who don’t have access to clean water. I realized tis even more so when the safety of water was compromised in our town and we were under a “boil water” order. 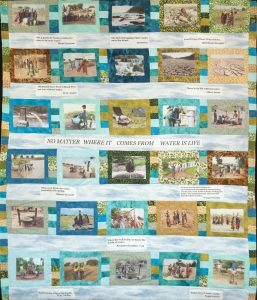 These issues influenced my thoughts regarding the theme of the quilt challenge and inspired a wish to provide a solution for those who do not have clean water. A vision of what it would be like for the women and children when the water tap is finally turned on, materialized with an image of a beautiful rainbow of hope with women and children dancing to celebrate their freedom from the labor of finding and carrying water. My quilt signifies the implications between having clean or contaminated water and how it affects women and young girls. 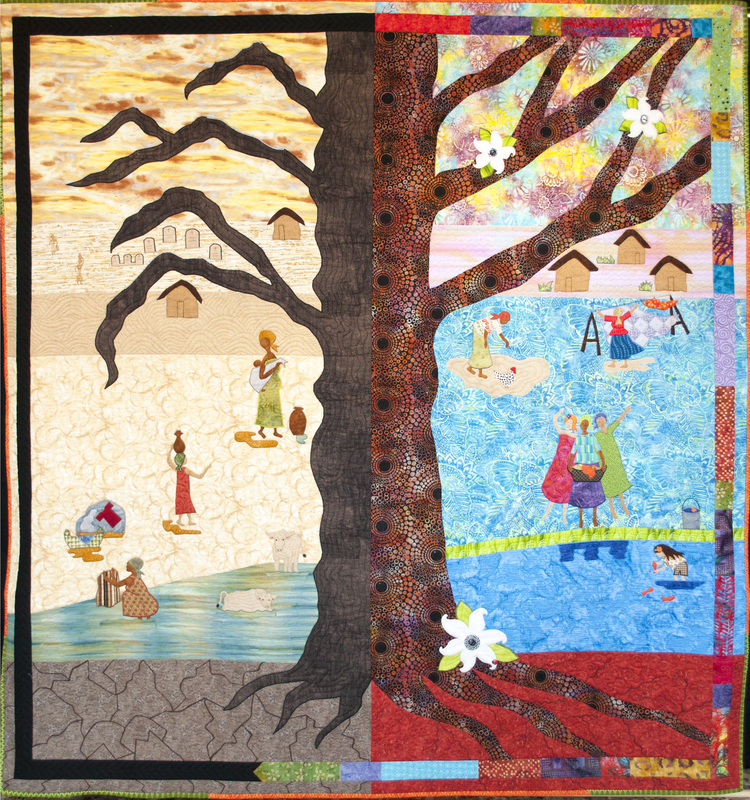 In the center of the quilt is a large tree. On the left side the tree is dying, showing life’s hardships, while on the right side the tree is alive with blooms, thanks to the water running through it with blue thread. People are walking long distances for water. They pass a small graveyard along the way. There is a woman washing her clothes in a lake of dirty contaminated water where there are cattle grazing as well, up stream. A mother is looking back at her daughter, carrying this dirty water, and realizing how they will use the water later for drinking – knowing they can become ill or, worse, die! The right side shows the effects of clean water – where women can thrive. Thrive with life! A woman is hanging up clean laundry while another feeds her chicken. Grass is growing and flowers are blooming. Women have emotional and physical needs. Clean water can provide these needs. Three women are working together and singing for joy! There is a young girl playing in the water and catching fish. 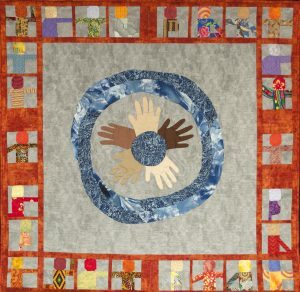 There are three different skin tones throughout the quilt and representing all people. The black border on the left reflects the dying contaminated side. The colorful border is for a better life with clean water. On the bottom the colorful border is running into the black signifying HOPE for a better tomorrow! Water is a deeply complex issue, swirling with interwoven challenges of safety, security, social justice, and access. Only transparently clear, progressive, democratic governance can ensure a good flow of information and funding streams. As the traditional water gatherers who understand what is best for their communities, women deserve a place in discussions and in decision-making related to water use. When mandates become “womandates,” results are life-affirming. Living in Rome, Italy, it is hard not to come across water fountains for people to drink water from. Roman aqueducts have been around since 32BCE allowing everyone in the city access to clean water. I feel that if this had not been so readily available to the citizens of Rome, there would be no city here. 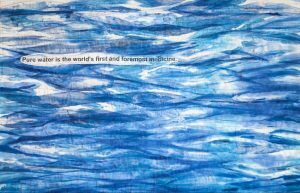 In using the traditional pattern called “Storm at Sea”, I selected various colors to represent the search and hardships of finding clean water by the women and children of the world. The color burgundy represents the dangers involved in finding drinkable water. The orange and the yellow represent the sun that dries up the source of water. Vegetation is represented with green patches while beige shows the dry land areas and blue in the clean central area represents water. Climate Change or Where Does the Water Go? Today most fresh water exists in the form of ice and snow or in-ground water and soil moisture, with only 0.3% in liquid form on the surface of the earth. 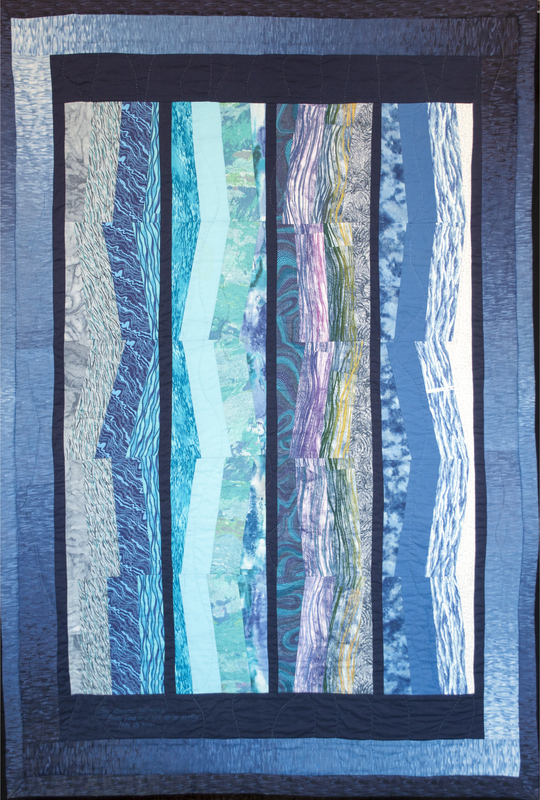 The artists collaborated on this quilt using a silk-fusion center-piece depicting available liquid water, surrounded by commercial silk fabrics depicting glacial ice, and finally the outer border of hand-dyed cottons, linen and silk, depicting water trapped in the earth. The importance of availability of clean water to women and children becomes increasingly tied to climate change and adverse weather events. Awareness and education are what is needed to influence governments to make policies that will ensure fresh and available water for everyone. 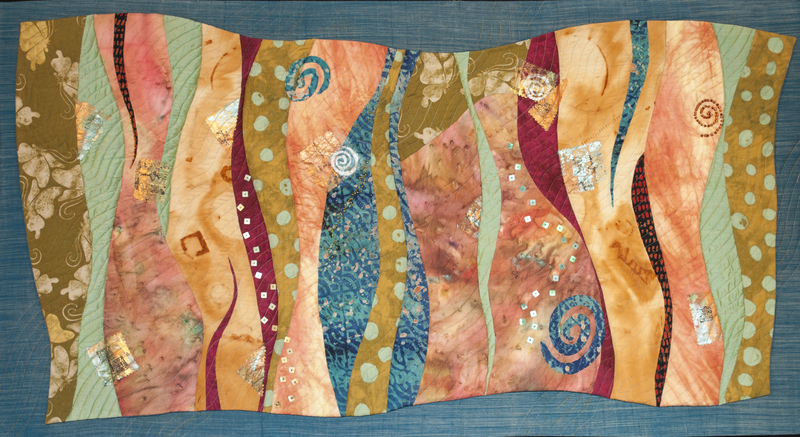 My quilts are patterns of cloth with which I tell a story, describe a feeling, or send a message. In my work there is always the hope that life itself would also be well made and lovingly touched by the human hand. My threads, fabrics, and every quilted stitch, are words that I cannot say in any other way. I speak a language that would pull us closer together and make us more aware of one another in the fabric of our commonality, a sisterhood of mothers and daughters. 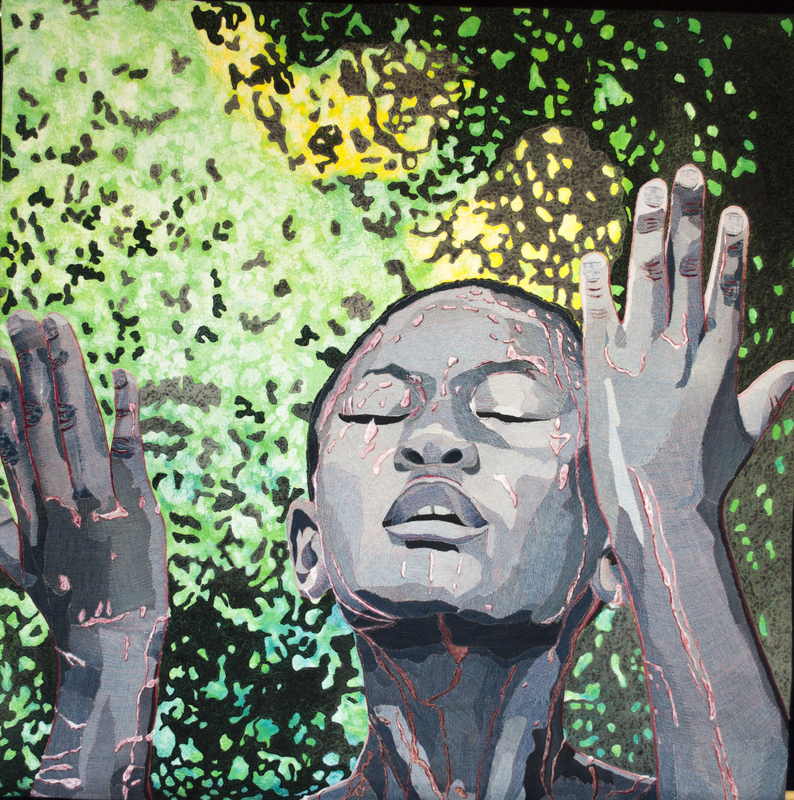 Not so much art for art’s sake, but art to inspire the maturation of human consciousness, towards openness of hand, toward love and justice, and the sound of water in the dreams of children. 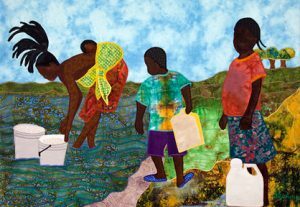 Therefore, my quilt is a petition that no one, women and girls in particular, should be deprived of their daily share of fresh water. The needs of women are many as they nurture and care for their families. Young girls are often required to shoulder these responsibilities at an early age. 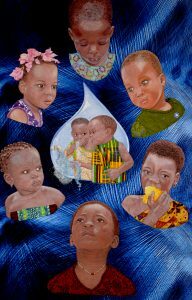 Throughout life, be it years of childhood, puberty and menstruation, child bearing, or old age, water is crucial. 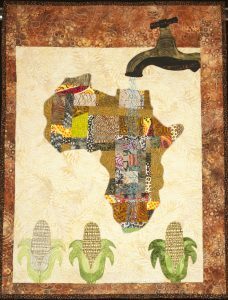 Thus my quilt is a prayer said on behalf of women and girls all over the world. It is my prayer that this quilt will excite discussion and action. Our planet consists mostly of water yet according to where you live you may have to walk many hours to find some. This is a representation of a reverse landscape, where the land is water and the water is a mix of paths. It looks so easy to reach the well, but the paths are confusing, muddy and narrow, the same way a women’s life can be during her daily search for drinking water. A red mark (as on google map) shows the well location. The background is made by sewn squares disposed as a mosaic on the walls of a bathroom. Using thermo fused appliqué the paths were applied to create a kind of spider web of up and down lines, a symbol of the long and difficult task to find water. Techniques comprise machine sewn and free hand machine quilted, while fabrics include cotton fabrics and polyester batting as well as Rayon and cotton threads. When I think of the world water crisis the image of parched endless lands with nothing but heat and dust comes to mind. There is no way for a mother to quench the thirst of a child so parched he can no longer walk. The failure of rains has put tremendous strain on the nutrition, health and general welfare of as many as 16 million people in a dozen countries, including millions of children. The U.N. estimates that more than one in six people worldwide do not have access to 20-50 liters (5-13 gallons) of safe fresh water a day to ensure their basic needs for drinking, cooking and cleaning. Carefully, I assembled this quilt from thousands of tiny snippets of colored cotton fabric to achieve the results I hoped for. Piece-by-piece I assembled it, much like the women who gather water for their families; step-by-step she gathers water for her family. During their daily journey for water, women in remote drought-affected areas of the world are confronted with treacherous and time-consuming obstacles. The average distance women and children walk for water daily in Africa and Asia is six kilometers (3.7 miles). Every drop of water makes a huge impact on her life. Every day she brings them water. Toxic mining practices and industrial waste are in the news, as rivers and other water sources are polluted due to outdated laws such as the 1872 Mining Law. In August 2015, contaminated water was released from the Gold King Mine, into the Animas River. Independent testing showed Radium 226 & 228 in the water and this poisoned water has flowed through the Navajo Nation, down to Lake Powell. Contaminated water in Flint Michigan has also been in the news. Water is the source of life on this planet and if we poison our own water sources, we are poisoning our future. Many more stories about contaminated water will surface in the coming years and we need to find a way to change our policies so these problems are stated truthfully to the communities affected. 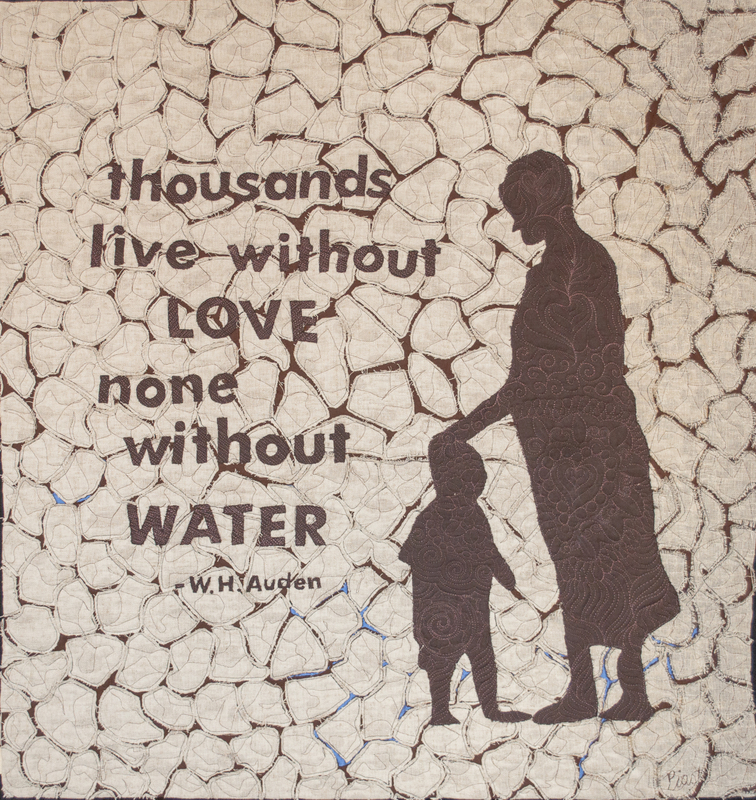 Without safe water, we have nothing. The dramatic 2011 Tohoku Tsunami that struck Japan was a natural disaster that greatly affected the water quality in Japan and beyond. Seeing photos of a washing machine from Japan that had floated up on a beach in Alaska, I was awestruck. It shocked me into realizing that this tsunami was impacting the water quality everywhere the tide took the water. Women, children and all mankind were affected. There was toxic waste from the damaged Fukushima nuclear power plant. The water was full of floating building materials from the many houses and structures that got swept away by the power of the surge. The ocean was swimming with waste and toxicity. Women and children, in the immediate area as well as all the areas where the tide took the polluted water, lost the ability to fish for food themselves. Even the opportunity to resell ocean products was hampered. Agriculture, too, was impacted due to the lack of clean water. Beaches in Alaska were so cluttered with plastic netting, bottles and micro plastics that tourists were not able to walk the beach, let alone eat the local fish. Some women and children reported illnesses, due to poor water quality as a result of this disaster. I decided to create a piece of art that would address the impact of this event. My design idea was to show how the water looked below the surface. I wanted to capture the wave motion and swirling water of the tsunami. My selection of prize fabrics include a rust dyed piece, a hand painted one, and a feature piece from Ghana along with my hand dyes. Embellishments of stamped Asian caricatures that appear to be floating and silk fabrics add the Asian influence. The Beads and sequins resemble water bubbling. 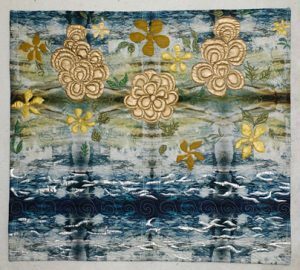 My hope is that this piece stimulates the viewer to think about how women and children in the coastal area of Japan and all along the tidal path of the Tohoku tsunami were affected by the water devastation. Globally we should all realize how women and children are impacted by poor quality of water whenever a natural disaster occurs. 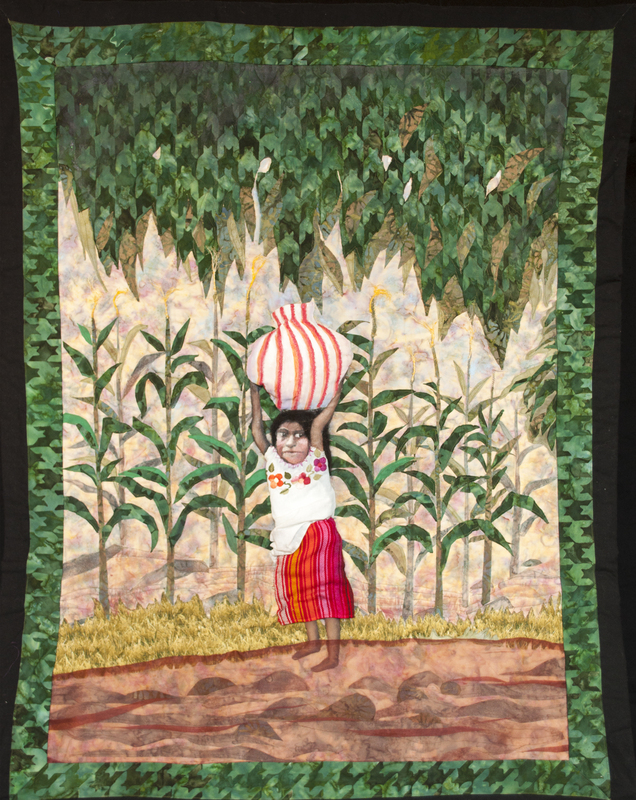 I chose this subject to highlight the struggles faced by Guatemalan women to obtain clean water. The idea originated from a photo from Miraclesinaction.org, a nonprofit organization providing water filtration systems to Guatemalan families. This is my second art quilt. I’m a multimedia artist with experience in sculpture and pastels, most recently in acrylic reliefs on palm fronds. 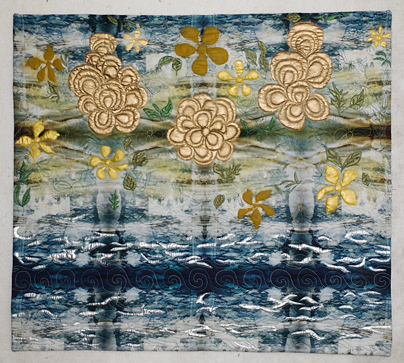 This work has been machine appliquéd and painted on several layers of fabric to achieve depth. The child is achieved by trapunto and her hair is needle felted alpaca wool. Her shirt is a traditional design embroidered by Maria, a Mayan artisan. Awareness that clean water is essential to life and critical to the existence of a healthy planet is spreading across the world. Water has become polluted and is causing worldwide suffering. The threat of global warming further threatens world populations as droughts and the depletion of reserves make clean water increasingly scarce. The planetary impact is gravely serious as the water crisis expands and threatens the existence and quality of life not only for women and their children but also families throughout the world. The crisis affects all creatures on earth, as water is the basis for existence of life on earth. My piece, “A Tree of Life,” honors this miracle of life representing the web of interconnection among life forms and elements on earth. The water is depicted as the essence allowing this tree and all of its life forms to thrive and grow. 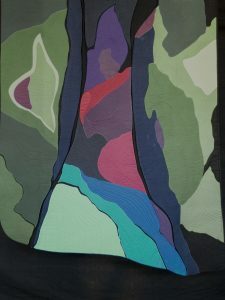 The green shapes of the tree portray the seven continents. The placement of the creatures loosely corresponds to where they may live. Although only a tiny leaf on the tree, human beings are responsible for its future. 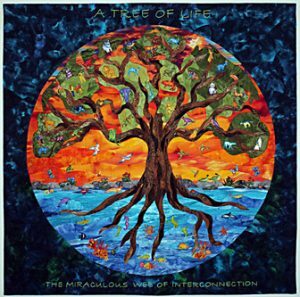 May we learn to protect, cherish, nourish and preserve the Tree of Life so it may grow in peace and harmony for women, children and all peoples and creatures living on our earth. While waterways pervade human history as economic resources, they also play a role in emotional life. We seek out beaches, lakes and rivers for personal renewal and solace. The river metaphor was healing in my own grieving process, which in turn inspired me to conceptualize its soothing effect on women worldwide. 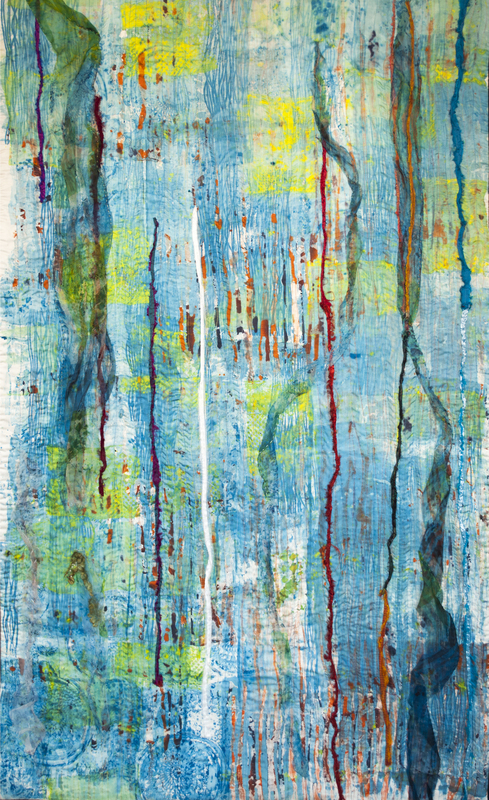 Water’s movements, colors, and patterns bring beauty to women everywhere. In the midst of whatever economic or environmental relationship a woman has with water, she takes pleasure in its restorative effects. The hand-embroidered haiku at the lower edge sums up this idea. My intention was to include this less-tangible element in our consideration of women’s bonds with waterways of all kinds. 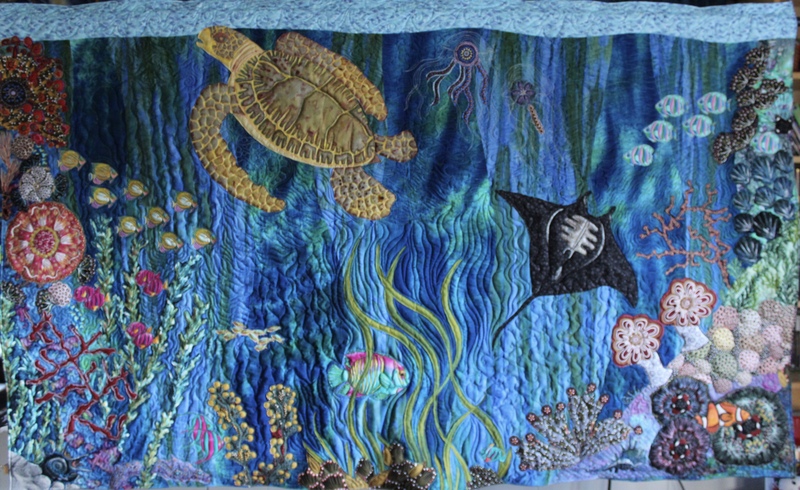 This original design, constructed, quilted, and finished using machine-piecing, hand-quilting, hand-embroidery includes materials such as commercial cottons, recycled cottons, and cotton batting. 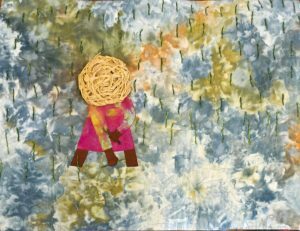 I approached this art quilt challenge not only as a fiber artist but as a mother, a humanist, and woman living in the drought-stricken state of California. In order to nurture, grow, and create, clean water is necessary; unfortunately water is also a limited resource. 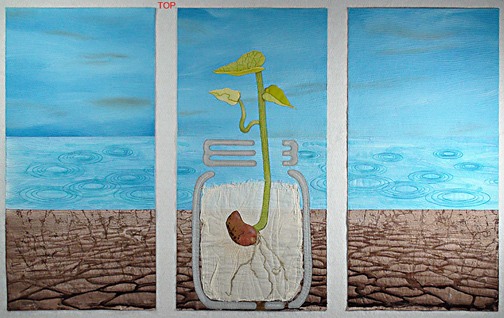 The lone seed in A Clear Necessity is a reminder that without water there is no sustenance. We can’t wait for the sky to produce snow or rain. Every time I turn on a faucet, water a plant, or clean out a paint brush, I’m reminded of how fortunate I am to live where I do, even with local restrictions on water usage. Access to clean water is one of the most basic human rights and I admire the women who, despite their environment and economic situations, do what they can to bring water to their families and communities. I appreciate those who are working to build the technologies that will help bring clean water to all people, especially women and girls… it can’t happen too soon. A Clear Necessity is a triptych made using hand painted fabric, textile paint and wax pastels. It is raw edge fused and has cheesecloth and primitive spun yarn. 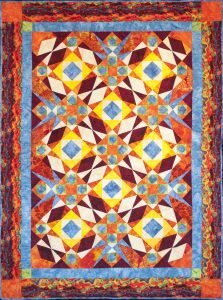 It is layered with cotton batting and commercial cotton backing and has machine quilting and thread play with a blanket stitch finish. 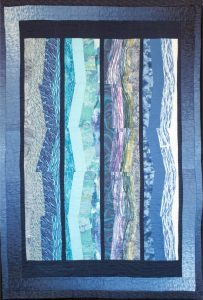 For my “Water is Life” entry, I have made a quasi-abstract quilt that evokes the coolness of running water. Starting with a photo I took in the southern Alps, I designed the fabric on the spoonflower.com site, and then had Spoonflower print it for me. After quilting the fabric, I used oil paint sticks and acrylic paint. Mountains are a source of clean water. Springs start there, run down to form streams and then rivers. At some point, due largely to the activities of man, they are no longer clean. But they could be, if action were taken. I was raised in the Rocky Mountains, we had good, clean, tasty water running from our taps, which we took for granted. I have found a new mountain home in the Alps, and the water is equally excellent. But this exceptional situation is far from being the case for vast numbers of people. Access to any water at all is often very difficult if not impossible. All the rest of life is complicated by this situation. Awareness of the problem is the first step towards solving it. The United States of America has people living without water and sanitation in their homes. Estimates are that in the 21st century 40 percent of Navajo Indians don’t have running water or a toilet. How can this be? One of the worst examples is the area around Thoreau, New Mexico. It is the women and girls of Thoreau, New Mexico who are my inspiration to tell this story. Women and girls cook and clean the house. In Thoreau, there used to be livestock, which provided food, hides, wool and transportation. Most have died for lack of water. Navajos use water conservatively but for the last six years the people of Thoreau have had to rely on the yellow truck driven by Darlene Arviso, delivering her Liquid Gold. This truck dispenses approximately 200 gallons which must last each family three weeks. These brave women use less than 7 gallons of water a day for family needs. They reuse water until it is too sudsy and dirty and then wash the floor with that. For comparison, in California families average over 350 gallons per day. When DIGDEEP Water (a nonprofit) heard of the Navajo crisis, they began raising money but the issues are great. Wells in this part of the world cost much more since the land is contaminated and they have to be dug down over 2,000 feet to reach clean water. The August 2016 Gold King Mine spill into the Animus River will likely cause more heartache for the Navajo. It joins the San Juan River, which flows 215 miles through Navajo land. 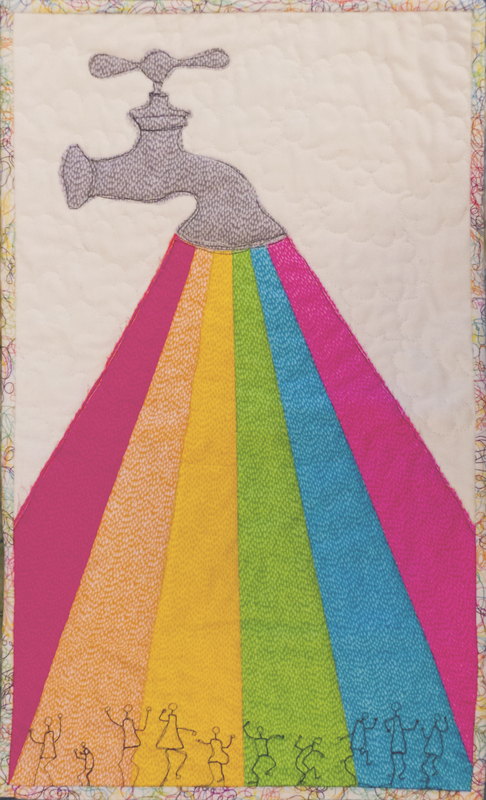 My quilt is a women in silhouette, with a water container on her head. This symbolizes women across the globe, who carry water retrieved from long distances. The waterfall flowing from the heart of the silhouette is symbolic of well springs of life. The girls standing in the water are exaggerated in height to signify dignity, confidence, and freedom. The colors used are symbolic of countries worldwide including those inEurope, America, Asia, and Africa, such as Thailand and Switzerland. Because birds migrate to large bodies of water, I have chosen my third layer to be a depiction of cranes, with an intricate design much like a waterfall. 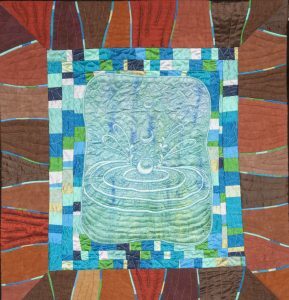 The poem written across the top portion of the quilt explains the impact of water on life; it also gives a new dimension to my work. 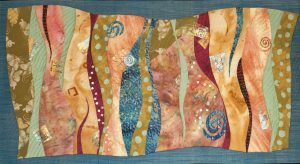 I sew using both hand and machine methods. This quilt challenge inspired me to go green by collecting rainwater and recycling it for daily usage. Living in close proximately to the Pacific Ocean I feel that any body of water radiates energy within me that my body craves. 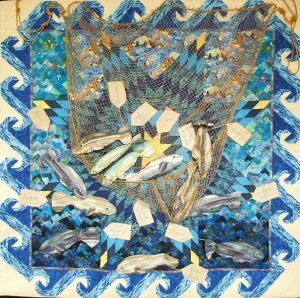 My textile artwork “Pescadero” symbolizes my love of the Pacific Ocean and the freedom to enjoy this majestic ocean. Gazing at the Pacific Ocean one day and the way it was gushing in and out with the tide and all around the terrain brought joy to my heart. Without this precious commodity, water, we are lifeless and a suffering society. Disease can take over without proper hygiene, lives can and do perish without proper water sources, which means clean water. In many countries people do not have the luxury of having water come from a convenient tap and that means carrying water – which normally is a women’s job, taking precious time away from education and family. Without needed education this limits life choices and the cycle of uneducated women continues. When women are not educated they cannot properly educate their own children and have the knowledge to create jobs that might benefit them and their families. I am a believer; I believe anything is possible. I am a dreamer; I dream of the day where every human being has access to clean water. My artwork is named “Water Line”: it depicts children waiting in line for unclean water – when what is needed is a water line that pumps in clean water. 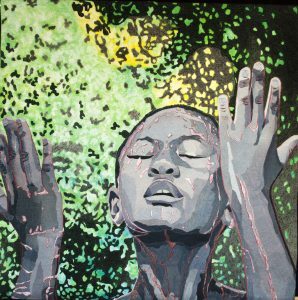 As an artist, I am interested in creating work that speaks to the civil rights of mankind; to take a critical view of social, political and cultural issues. Sometimes I am compelled to create not what is, but what can be. As I think on the issues of life-sustaining water and the lack thereof, I am forced to think of the many women and children who go without. Those thoughts compel me to create work which encourages world change. My artwork needs to say something, tell a story; a story worth telling. A story that encourages, convicts, compels and challenges us to bring clean water to every human being in the world. 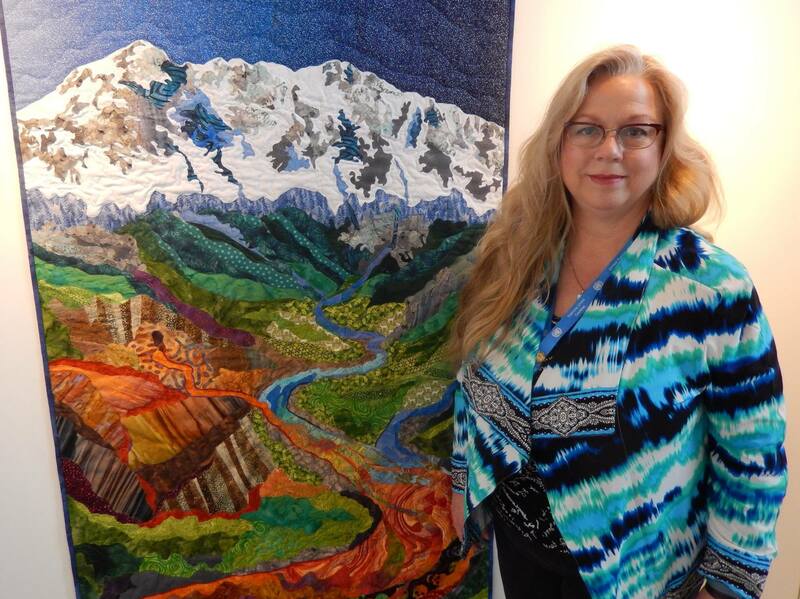 As a story art quilt maker, I tell stories that live deep inside of me. Some works are a collaboration of many stories brought together to make one piece. While others depict defining moments, I have chosen to pay close attention to the need for clean water. I hope my artwork stirs up something on the inside of each person who views it. I hope it stirs up change in the world’s water situation. There is no shame in not having what you need; the shame is seeing the needs of the less fortunate and doing nothing about it. Let’s do something! Throughout the world, women rely heavily on fish as the primary source of food to feed their families. Fish for Dinner was created as a reminder that not all fish caught from oceans and rivers is suitable for eating because of hidden toxins and that it is our responsibility to make changes to solve the problem of our contaminated waters. Farming, industrial, and nuclear waste end up in waterways along with sewage and garbage, creating a toxic mess which is ingested by marine life, thereby entering contaminants into the food chain. Scientists say that the long term risk of consuming contaminated seafood could lead to high rates of cancer and a host of other diseases. This problem is so widespread that it is now a global problem which needs to be addressed with regulations on plastics and ocean dumping. I have always lived near the ocean. Having dug clams and gone fishing with my father for that night’s dinner, I have a personal response to the alarming problem we now have to fix. Schooling fish are one of the most fascinating sights underwater and I wanted to depict the fleeting freedom of fish as they move through water. Seemingly unharmed, no one sees the toxins lurking within. 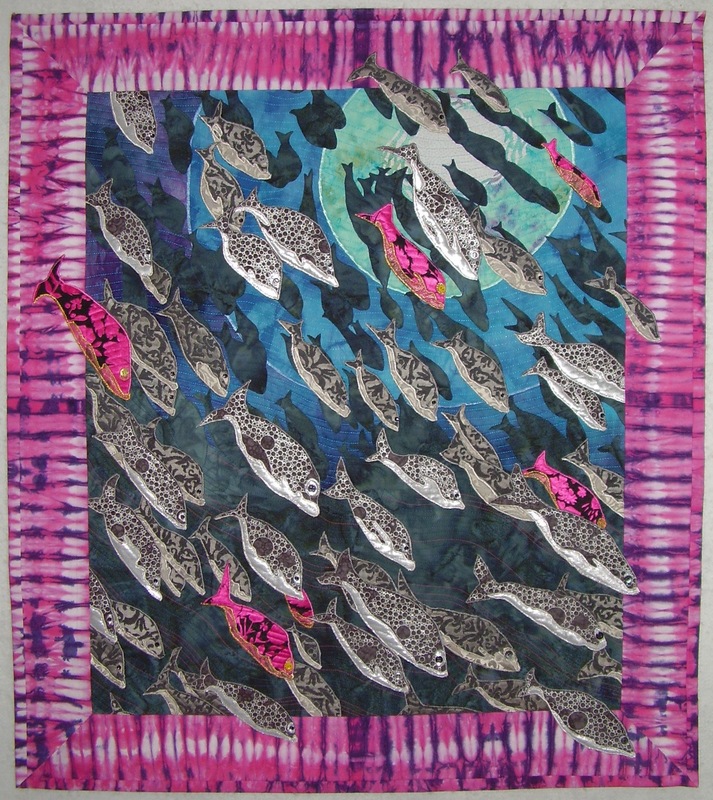 In my design, the pink areas in the piece represent those fish which are carrying toxins within their bodies and in the case of the border, the toxin itself is represented by a pink shibori fabric. 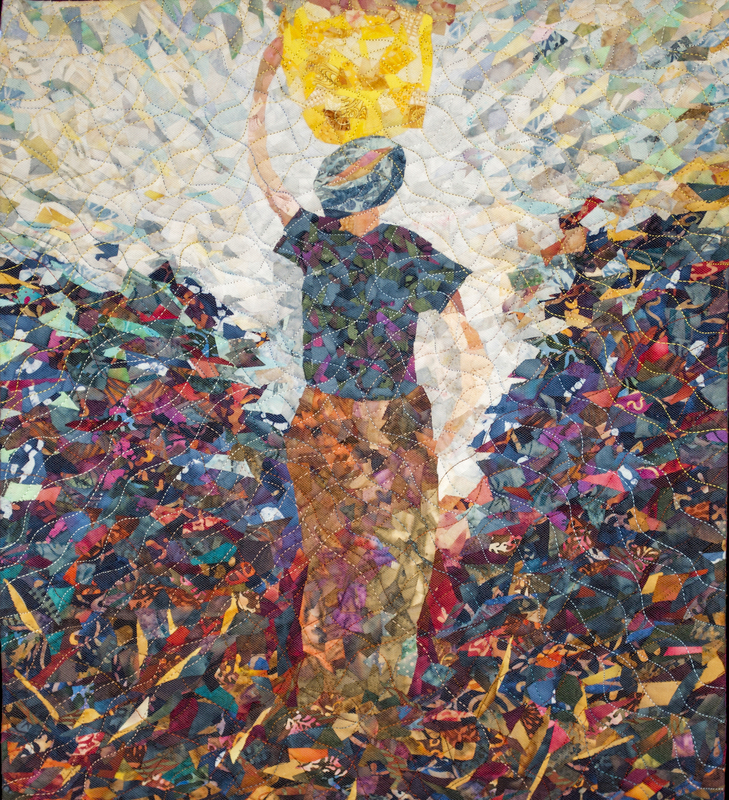 Though entirely contemporary, my quilts are primarily hand stitched, representing traditional “women’s work.” I use modern materials – upcycled household plastics and more – which create reflective, dimensional surfaces to tell their stories. Themes of importance to me : cave paintings of Europe and Australia, the fecundity of pomegranates, and industrial detritus: rusty metal, bits of plastic and random “junk” which sparkles and seduces, guide me. Here I probe our ever more polluted water and its impact on families. 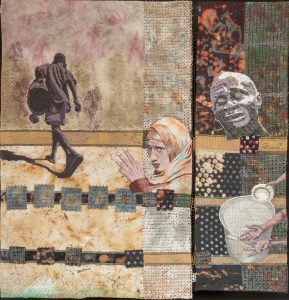 Gyre #8 represents the difficulty women (and children) have when, after walking great distances, they encounter, instead of potable water, others’ detritus. This is a particular tragedy in developing areas such as parts of Africa and Asia where women have often come to represent an underclass. They are frequently prevented from getting an advanced education, making a viable contribution to their cultures and pursuing their dreams as their time is spent in pursuit of clean water. Filthy water can cause terrible health issues and shorten life expectancy as well. 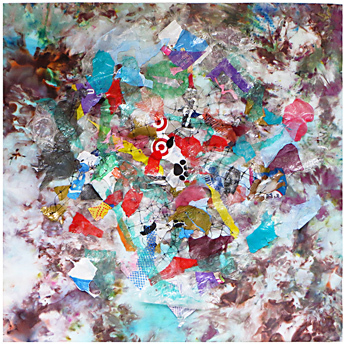 Gyre #8 is comprised of an ice-dyed cotton ground fabric over-laid with commercial plastic packaging which has found its way into my home. 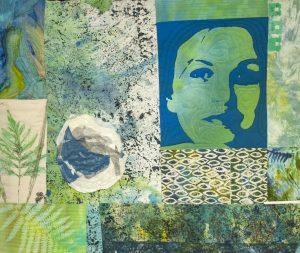 By means of repurposing this material I am able to meet the objective of my artwork which is to awaken the mind and heart of the viewer. Coral reefs cover less than 1% of the ocean floor and yet they are home to 25% of marine life; comprising the highest biodiversity of any ecosystem on earth. Women depend on the reefs for food, which feed one billion people worldwide. In coastal populations women are protected from storms by the barriers the reefs create, which lessen damage from extreme tides. A wide variety of medicines derive from coral reef flora and fauna; medicines which help women with labor and delivery as well as those used to treat cancer, arthritis, and heart disease. Tourism focused on reefs offers women employment and income. Unfortunately, coral reefs are being stressed by higher water temperatures, related to climate change and acidification caused by increased carbon dioxide levels. This stress has led to 60 bleaching events around the world since 1979 and, while coral reefs can recover from bleaching, within 50 years these stressors might become so severe that the reefs will not recover. Without vibrant, healthy coral reefs, women worldwide will struggle to feed their families, their homes will be threatened by more extreme storms, and they will miss out on the benefits of medicines derived from reef plants and creatures. We must all come together to reverse the high sea temperatures caused by climate change; to decrease the amount of carbon dioxide in the air; to stop overfishing and to protect the invaluable bounty of our precious coral reefs.